BetEasy is one of Australia’s best online betting sites and is a great place for esports fans to wager on their favourite pro gaming events. 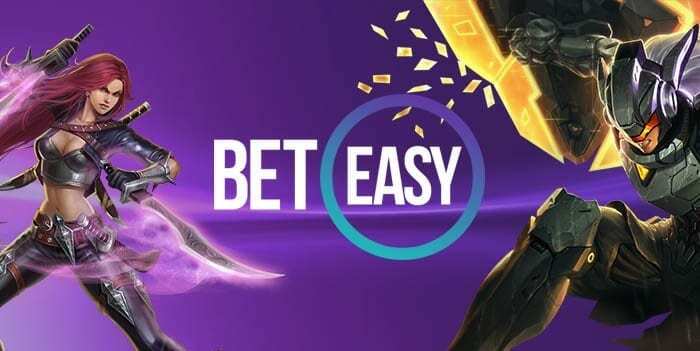 Previously known as CrownBet and the property of Crown Resorts, BetEasy is the product of a merger between former Australian brands CrownBet and WilliamHill after the Stars Group purchased the companies in 2017 from Australian billionaire James Packer. BetEasy is still operated in Australian and offers extensive esports, racing and sporting betting markets in addition to a high-quality mobile betting interface, regular bonuses and promotions and a loyalty rewards system that edges out its competitors in value. This review covers current bonus offers, esports betting options, licensing and security, payment methods and our overall verdict on whether it is the best pick for Aussie esports fans keen to have a punt on CS:GO, Dota 2, League of Legends and more. BetEasy.com.au is primarily focused on providing betting services to Aussie punters, including Australian esports fans. New Zealand punters are also well taken care of at the site and at the time of this review, BetEasy also fully accepts sign ups from dozens of other countries and territories, including the following regions: Anguilla, Argentina, Austria, Bangladesh, Bosnia and Herzegovina, Christmas Island, Cocos (Keeling) Islands, Cook Islands, Croatia, Finland, Fiji, Guernsey, Gibraltar, Greenland, Hungary, Indonesia, Iceland, Japan, Jamaica, Jersey, Liechtenstein, Lithuania, Luxembourg, Macao, Maldives, Malta, Monaco, Moldova, Northern Mariana Islands, Mauritania, Malaysia, Nepal, Norfolk Islands, Norway, Papua New Guinea, Paraguay, Peru, San Marino, Slovakia, Solomon Islands, South Korea, Sweden, Thailand, Tonga, Uruguay, Saint Vincent and the Grenadines, Vietnam, Vanuatu, Samoa. BetEasy is an Australian-licensed online bookmaker that excludes several regions from signing up due to differing online gambling laws. The following countries are restricted from creating an account at BetEasy: Afghanistan, American Samoa, Aruba, Bahamas, Bahrain, Barbados, Belarus, Belgium, Bulgaria, Burma, Brazil, Canada, China, China, (Hong Kong S.A.R.) Congo, (Republic of the) Cote D’Ivoire, Cuba, Cyprus, Denmark, France, French Guiana, French Polynesia, French Southern Territories, Germany, Greece, Guadeloupe, Guam, Hong Kong, India, Iran, Iraq, Ireland, Israel, Italy, Korea, North Lativa, Lebanon, Liberia, Libya, Macau, Marshall Islands, Martinique, Mayotte, Mexico, Micronesia, Myanmar, Netherlands, New Caledonia, Nigeria, Northern Mariana Islands, Pakistan, Palestinian Territories, Philippines, Poland, Puerto Rico, Republic of South Sudan, Reunion, Russia, Rwanda, Saint Barthelemy, Saint Martin, Saint Pierre and Miquelon, Serbia, Sierra Leone, Singapore, Spain, Sudan, Syria, Taiwan, Tanzania, Timor-Leste (Democratic Republic of), Tunisia, Turkey, Turkmenistan, United Kingdom, United States, United States Minor Outlying Islands, Vatican City State (Holy See), Virgin Islands (US), Wallis And Futuna Islands, Zimbabwe. If you are reading this review from a country excluded from BetEasy, please check out EsportBet.com’s best betting sites guide which breaks down the top-rated online sportsbooks servicing esports fans from your region. BetEasy is consistently recommended by fellow punters for its exclusive membership promotions and regular bonus offers and at the time of this review we found that common opinion to remain true, especially for esports fans who also like to bet on their favourite racing events or sports. Currently, all of our readers from Australia and New Zealand can claim up to $500 in bonus bets if you create an account at BetEasy.com.au via our links and make a deposit. The bonus bet offer is simple: BetEasy matches your first deposit amount by 100% of its value, up to a maximum deposit of $500. If you deposit $500, BetEasy will match your deposit in bonus bets, meaning more money to bet on your favourite esports players and teams. Compared to many other Australian online betting sites, this welcome bonus offers incredible value. The welcome bonus is valid for 7 days, and winnings from bonus bets must be turned over at odds of $1.50 or greater, which is standard at most AU bookmakers. Unfortunately, it also excludes certain states and territories – in this case, VIC, NSW, SA & WA – due to differing state laws on sports betting. BetEasy’s Rewards program is also one of the best presently offered by Australian online bookmakers – earn points by betting to spend on specials like movie tickets, gift cards, sporting tickets and more. Learn more about how to claim BetEasy Rewards points here. If you are wondering, there currently are no specific bonuses or promotions tailored solely for the purpose for esports fans. While esports betting markets are greatly supported at BetEasy, it doesn’t look like the bookmaker has made the move to cater exclusively to pro gaming punters in anyway just yet – we hope to see something from them in the near future. Beteasy boasts one of the cleanest bookmaker designs out there, with a lack of intrusive and spammy advertisements that tend to cover the pages of a vast majority of their competitors. The desktop site loads fast and all esports, sports and racing markets are clearly presented and easily navigated in drop-down menus on the left-hand side of the page. The main horizontal bar at the top of the page gives quick access to all featured sports and racing events, alongside promotions and rewards in special ‘tabs’ that load onto more dedicated hubs. The BetEasy virtual betting slip is always displayed on the right-hand side, clearly showing and outlining which pending bets are lined-up, along with current odds and calculated returns automatically loaded to make figuring out the stakes of your latest esports wagers a breeze. For major esports events such as ESL One or The International, BetEasy also offers a vast range of outright markets and tournament specials that many other betting sites still don’t bother to offer for esports. You can bet on outright winners of the event, group winners, who will reach the finals, region of the winner, teams with most kills on a map, top teams per country, the time played on each map, and many more very specific options that will no doubt please super fans with intimate knowledge of the game and the players who may find an edge here. There are a few game-specific bets completely unique to BetEasy, such as the Hero Markets for Dota 2, where you can bet on several unique markets rarely offered at other Aussie bookmakers, such as the most banned hero, most picked hero, total heroes banned and picked, and most kills by a hero per map. Tournament specials for StarCraft II also let you bet on the race of the winning team’s in-game units. Overall, the team at EsportBet came away impressed with the esports betting options presently available at BetEasy, and can definitely see why the site is already so popular with many pro gaming fans who love to have a punt on their favourite pro players and teams. It isn’t just the bare minimum esports markets offered here (like many other lazy sites), and it’s clear BetEasy are paying attention to the industry’s major tournaments happening year-round. For AU and NZ esports punters, this is one of the best places to find options beyond outright winners. BetEasy offers many of Australia (and the world’s) most reputable and safest payment options to both fund your account and withdraw any potential winnings hassle-free. MasterCard and Visa credit or debit cards are the most popular and recommended option due to their instantaneous transfers, while PayPal and POLi (AU and NZ only) are also fully supported – all require a minimum $5 deposit to process. Bank transfers directly from your bank account (known as money wiring overseas) and BPay round out the options, but both take a little longer to process (1 – 2 business days) and a few more steps. During our testing period, BetEasy customer support proved to be extremely responsive across all channels of communication and gave us concrete answers to pretty much all of our queries, which is refreshing when coming from other online bookmakers that have clueless customer service teams. While many of the reps weren’t experts on esports, they did a great job of explaining the unique markets available – perfect for esports fans who are still new to betting on their favourite pro teams. The EsportBet editorial team loved our time using BetEasy to bet on CS:GO, Dota 2, League of Legends and more thanks to its extensive betting options, daily offers, professional customer support and hassle-free deposit and withdrawals. Their top-notch licensing and regulation in Australia leaves no doubt for local players as to the legitimacy and security of the bookmaker, either. Australian esports fans who are keen to have a punt on their favourite national and international players and teams competing in both major and regional events should seriously consider making BetEasy their main betting destination.